Arm your camera with this Tilta camera cage specifically designed for the Sony FS5. The cage’s top plate fits snugly around the Sony FS5 top handle and includes 15mm LWS rod adapters on the front and back end to allow you to mount accessories in a variety of ways. The Battery Plate for Sony FS5 Camera Cage (available in either gold mount or V-mount) has a 15mm LWS rod adapter that can be placed on either the top or bottom of the plate to allow you to either mount it off of 15mm LWS rods from the top plate or bottom shoulder pad. The battery plate provides several different DC and P-tap outputs to allow you to power accessories. 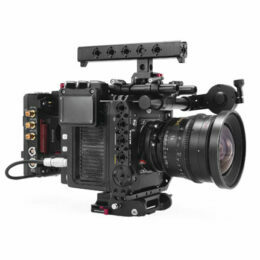 On the bottom of the cage is a Sony VCT-U14 compatible baseplate that allows you to attach various accessories via 15mm LWS rods on either the front or back side of the plate. The plate also has an ergonomic shoulder pad on the bottom so that you can quickly and easily detach from the VCT-U14 plate and be shoulder mount-ready in no time. The plate also has Arri Standard Rosette connections on either side to allow you to attach handles for handheld operation as well as a built-in lens adapter support bracket. An extendable rosette arm and extension cable are also included so that you can extend out and adjust the mounting position of your Sony FS5 handle to your liking.